The ISUD - International Symposium on Ultrasonic Doppler Method for Fluid Mechanics and Fluid Engineering - is the biennial event bringing together users and experts in the field of high resolution velocity profile measurement by use of ultrasound. 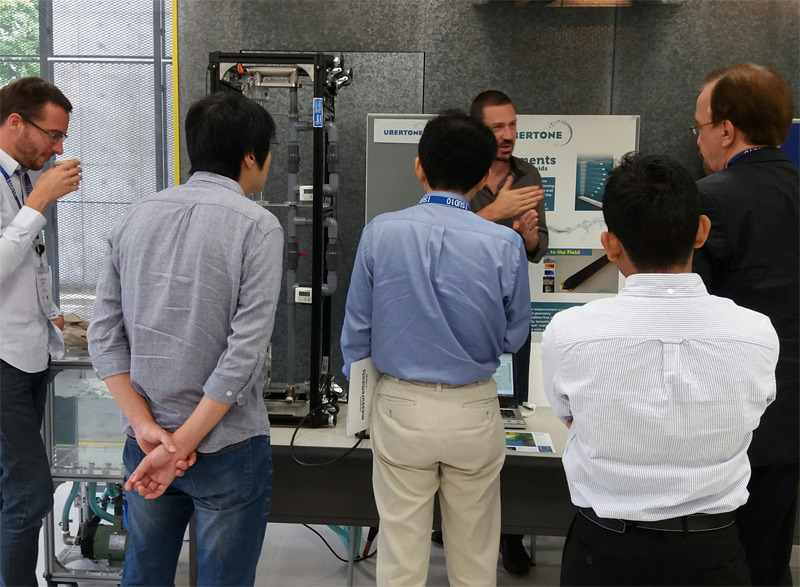 After having been organized by Ubertone in Strasbourg in 2014, the ISUD took place at the Tokyo Institute of Technology, Tokyo, Japan from September 28-30, 2016. This 10th edition, very well organized by Prof. Kikura and his team, gathered 62 participants coming from 10 countries. The number of participating researchers keeps increasing, showing accretion of interest on ultrasonic technology from all over the world. The first results of an aquatic drone for sewer inspection embedding an UB-Flow from Ubertone presented in: “3D interpolation in a velocity field in sewers” by Sebastian CEDILLO, Mathieu LEPOT, Stéphane FISCHER, François H.L.R. CLEMENS. More info about the FOULC project. Results from a study on an artificial stomach put forward in: “Study of the rheological properties of the retropulsive jet build by the antral contraction wave in a simplified artificial stomach” by Damien DUFOUR, Franz X. TANNER, Kathleen FEIGL, Yasushi TAKEDA, Stéphane FISCHER, Erich J. WINDHAB. At the end of the ISUD, Damien Dufour won the Ubertone Student Award for his work, article and presentation. We were pleased to meet our partners, customers and future users at Ubertone's desk inside the exhibition area of the ISUD. We demonstrated our UB-Lab velocity profiler measuring in clear water with a transducer clamped on a plastic pipe, kindly borrowed from Prof. Kikura's Lab. Visitors could evaluate the quality of the measurements as well as the ergonomic user interface. Beside the symposium, we also enjoyed an exciting cruise and dinner in Tokyo's bay. More details can be found on Titech's website. See you at the Physikalisch-Technische Bundesanstalt in Berlin, Germany in 2018 for the 11th edition !